Phoenix Daily Photo: Is It Fashion....or, Is It Art? 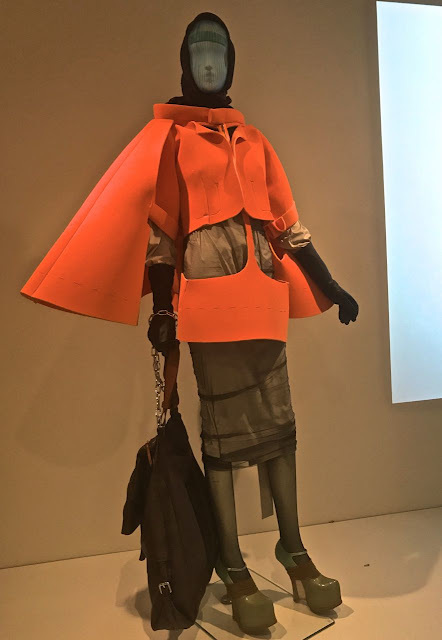 Last Sunday, I told you about the Fashion exhibit that was at the Phoenix Art Museum and I posted the one design I thought was wearable. Not by me of course, but by maybe a tall fashion model. And, it was also artistic in it's own way. That is more than I can say for some of the others in the show. 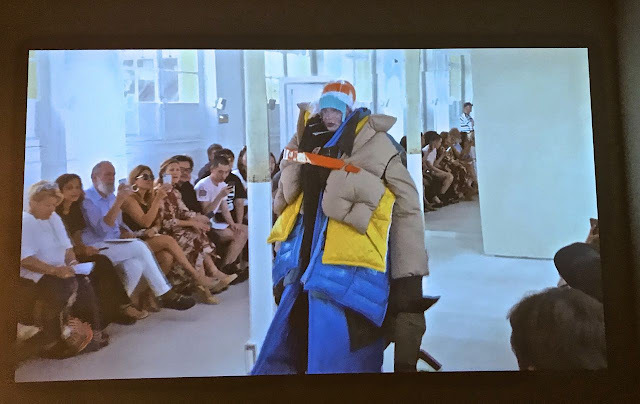 This ensemble to the left is created by a fashion house called Maison Margiela and it is what I'd call "off-the-wall" crazy. It's not what I would call wearable so is it art? I did a little research on the fashion house and I learned that they are known for deconstructive and avant-garde designs using unconventional materials. I cropped the photo down to the shoes so you could see how the shoes are covered in hosiery that is bunched up around the heel and across the front of the shoe. Very, very strange. 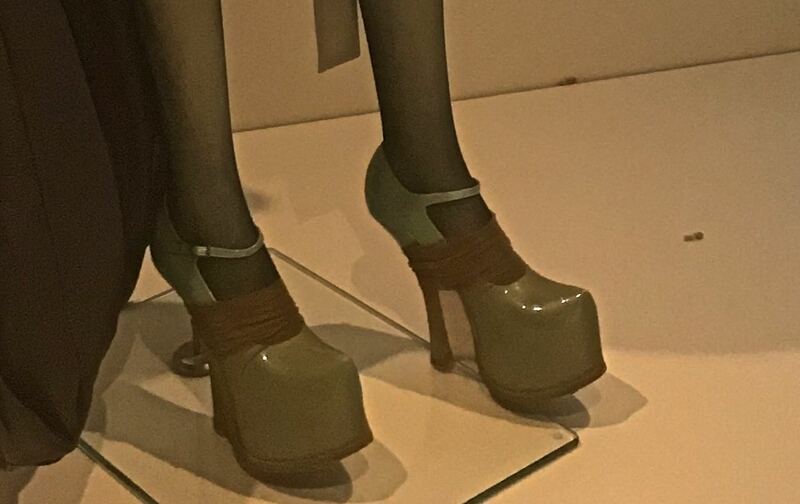 However, that wasn't as strange as the fashions from the same design house that were playing in the video the museum had on display. I snapped a couple of photos to show you. This lady looks like she has put on every coat in her closet. And, this lady looks like she's wrapped her self in a bolt of fabric and is carrying the whole bolt with her. The information I read about the design house also said that they tend to hold live shows in unusual settings and the model's faces are often obscured by fabric or goggles. Supposedly to direct attention to the "clothes" and the designs. (I put "clothes" in quotes because I'm not sure they actually qualify as clothes.) I was able to find the actual video that the museum was using and I've put a link to it here. It's well worth a peek even if it's just for a laugh or two. The bracelets to hold cell phones are a clever addition on some of the models in the video. I think this type of design is an aspect of fashion (or art) that I just don't get. However, if the purpose is to get one talking about it, then it worked. That is exactly what I'm doing. Wow. Like you, I don't really "get" fashion that isn't wearable. I sort of like that red jacket in the top photo, in a kind of abstract way. They must make some other things that people can actually wear or how do they stay in business? Very Weird, Sharon! 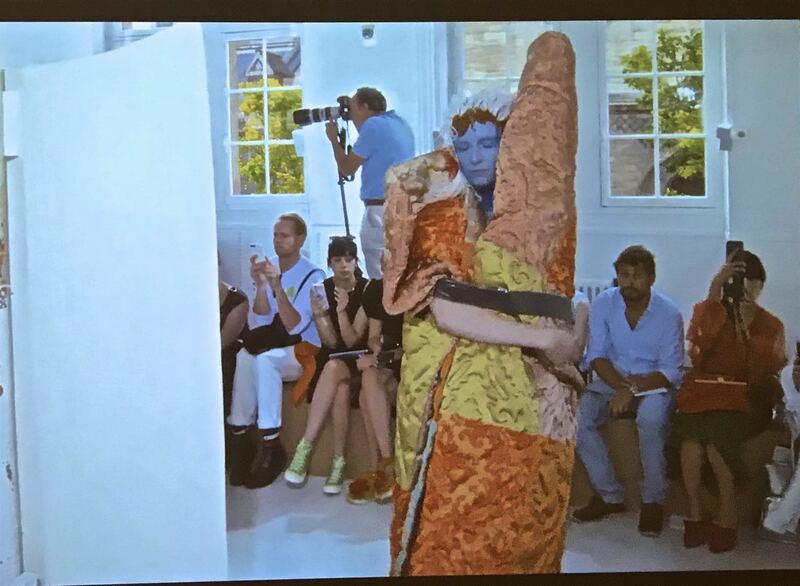 Yes, fashion can get really, really weird. I've always wondered why the industry seems to think it's the center of the universe and doesn't get that people are more often than not rolling their eyes at them.